Every restaurant keeps aside a considerable amount of its budget for restaurant marketing. With the rate at which the restaurant industry in India is sprawling, it becomes extensively important for restaurants to venture into catchy marketing activities. One of the best ways to ensure that your customers don’t forget you in the concrete jungle of a thousand other restaurants is to ensure that your brand engages in robust marketing that will keep you in sight and in mind of your competitors in the market. While running stellar marketing campaigns is difficult, it is more difficult to craft restaurant marketing campaigns of a restaurant chain. Running marketing campaigns for a standalone outlet is largely different from running restaurant marketing for restaurant chains. Read below and know the art of crafting stellar restaurant marketing campaigns for restaurant chains. Most restaurant chains struggle relentlessly when it comes to crafting marketing strategies for different geographies and different demographics. A marketing plan may work in one outlet, but it might fail to succeed in an outlet in a different location. This makes it extremely important to understand the demographics of the outlet and then craft marketing plans accordingly. Read below and garner a comprehensive knowledge about the ways you can market your restaurant chain. If your restaurant chain has a pan India presence, then you can hardly expect centralized offers and discounts to work in all the outlets. Moreover, many a time, it is seen that two brand outlets in the same city require different marketing strategies to keep the customers hitched. For example, if you are running two outlets in the same city, one in a locality populated with students and the other in a corporate complex, you will have to craft different marketing plans for the both. This is primarily because the customers you will attract in both these locations will be absolutely different. Hence, while running happy hour strategies in the outlet located in the student area might work, it might fail in the outlet located in the corporate complex, simply because the crowd here is not looking for cheap liquor. Similarly, if you are running festive special offers and discounts, you should understand that running the same offers at the same time will not be beneficial for you. you should weave festive special offers depending on the festivals that are popular in the specific location. Running special offers during the Ganapati festival in an outlet in Maharastra, during the Diwali season in North India, or during the Durga Puja in West Bengal would work, instead of running standard offers and discounts across all the outlets. Just like the offers and the discounts host events or festivals at your restaurant depending on the location and the demographic at hand. This would help you attract the locals which will have the potential of increasing your sales exponentially. You may think that running outlet specific offers and discounts is an extremely tedious task and this might compel you to think otherwise. However, there are restaurant management systems available in the market that will allow you to create custom campaigns for different outlets. This will also help you analyze the performance of all your outlets, and if you come across a particular outlet which isn’t performing as expected, you can invest more in running marketing campaigns for that specific outlet. Centralized CRM will come in handy while running a restaurant chain as it will ensure that a customer of one outlet will become the customer of the entire brand. Hence, if the customer visits a different outlet of the same brand, the staff will be able to view the entire ordering history, the personal details and the average amount spend of the customers. This would also help the staff to apply suggestive upselling techniques. The robust CRM database will also help you segregate the data and then run personalized marketing campaigns. You as a restaurant owner must remember that every customer likes it when you craft something especially for them. Hence, create special offers and discounts on the customer’s birthday and anniversaries, or offer them something special depending on their favourites or their ordering history. Such offers will make sure that your customers walk back in your restaurant, and this will bolster your efforts of customer retention. Almost all restaurants and restaurant chains have their own loyalty programs. Instead of running a centralized loyalty program, customize them and offer the customers what they like. The success rate of such loyalty programs will automatically increase and will help you in creating a band of loyal customers, which is extremely important if you want your restaurant business to blossom. You can run both point-based and visit-based loyalty programs. In the former, the customers will receive loyalty points as per the amount they spend at the restaurant. These are popular amongst the fine dine restaurants, where the customers tend to spend more than usual. The latter, on the other hand, is based on the number of visits a customer makes at your restaurant. This is more popular in QSR and casual dine restaurants where an average customer doesn’t spend much but they tend to visit the restaurants more often. While running outlet specific marketing campaigns isn’t an easy task, its importance is something that you simply cannot compromise with. 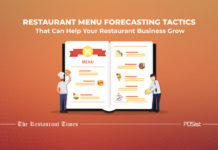 However, unearthing the different geographies, the demographics and the unveiling the customer psychology is a difficult task, and unless you can find the trick to comprehend them, it will be extremely difficult to craft that stellar restaurant marketing campaigns for your restaurant chains.